This is too easy. This is the best image of this area in existence. The Lunar Orbiter IV frames have too high of Sun and indifferent resolution, and there are no Apollo views of this piece of the Moon. Actually, the previous very best image is K.C. Pau’s remarkable shot with his 10″ telescope - the mantle of success is passed from amateur to amateur! And where is this area? A tip of the crater Daniell is at bottom right, and Mason and Plana are deeply shadowed at top right. 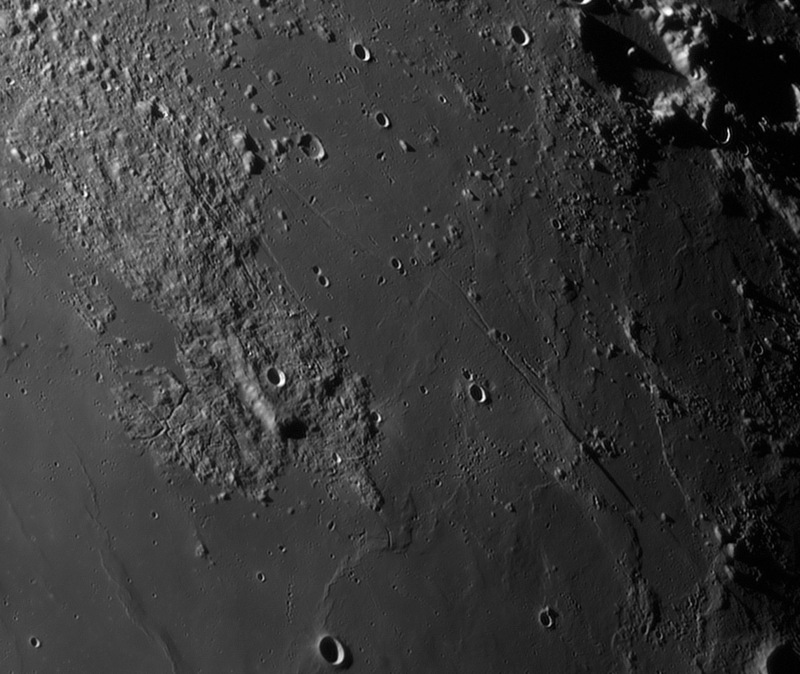 The rille-shredded Lacus Somniorum is middle-right, and a piece of Mare Serenitatis fills the lower-left, with Luther pitting bottom-center. Identifying landmarks is a way to fill space when there is nothing to say, and that is partly true here, because Wes’ image leaves me speechless. But there is such wonderful detail to be noticed, most impressively the shadow being cast by the Daniell Rille, which (as I said for K.C.’s image) means that there may be a component of vertical faulting. There is an offset of the rille at its southeast end where a slight shadow is cast by the isolated hill, and closer to Daniell a ridge shadow continues the trend. At the other end there is a very delicate rille which may have been unknown until now. Just north of the 9.3 km wide crater Plana G (the flat-floored one with a pit and a shadow) is a narrow rille trending in the same direction as the Daniell Rille. This new rille is about 85 km long and 900 m wide, at its widest. Two other sets of rilles demand our attention, too. Three or more rilles are embedded in the unnamed peninsula of Imbrium ejecta coming in from top-left. They have a slighly different orientation from the Daniell Rille and may have a completely different origin. Finally, the southernmost part of the peninsula is cut by a complex series of linear and sharply curved rilles, which don’t look like rilles elsewhere on the Moon. PS - I just got to Tucson for a meeting and so, late at night, am very pleased to replay this classic LPOD from Sept 12, 2007. 21st Century Atlas chart 9.